For about 2 years now I, like most women, have been hopelessly addicted to Pinterest. But, Pinterest was just the gateway drug. 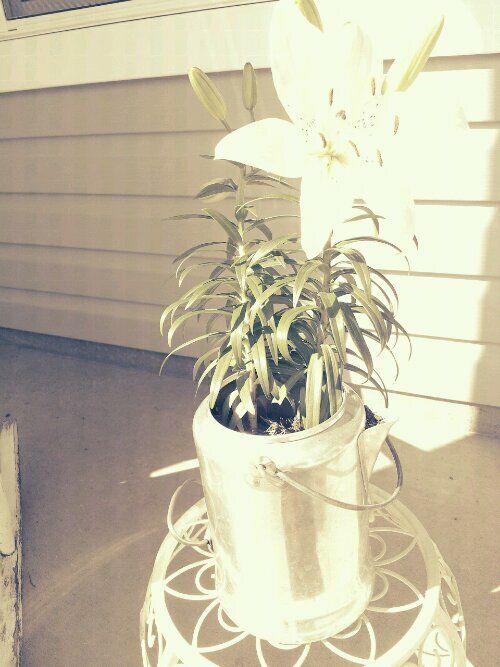 First I tried Pinterest, then I moved on to reading blogs about upcycled furniture, vintage makeovers and home decor. And once that didn’t quite get me goin’ anymore, I ventured out to thrift stores, garage sales and flea markets and started to do my own junking and makeovers. That’s when you’ve really succumb to the dark (and by dark I mean fabulous) side. BUT BUT BUT it CAN pay off! -Before you play on new chalkboard paint, you have to cover the whole surface with a layer of chalk and wipe it off. And have fun! Play games, label your dishes at a cook out, whatever floats your boat! Spent: $40 (primer, paint, brushes, etc.) Sold for: $100 Hundred dolla hollaaa! And it was even better that it went to a family with the cutest little girl who just loved drawing all over the table! 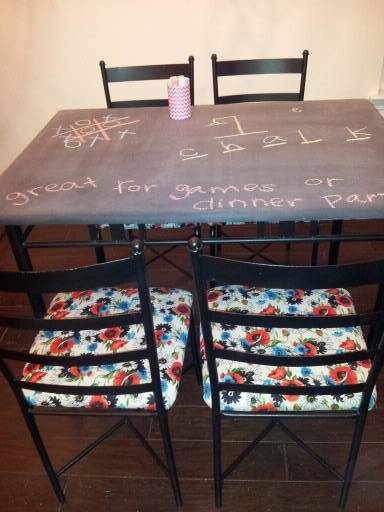 Any other ideas for fun places to use chalkboard paint?!? My very first before and afters! This is kind of pitiful, but my life for the past 2 weeks has completely revolved around a desk. Hey Erika, it’s beautiful outside, want to go to the beach? I can’t I have to paint a desk. Hey Erika, it’s dinner time, want to come in and eat? I can’t I have to paint a desk. and now it looks like a million bucks… well, I love it anyway! -Then, I cleaned all of the goop off with After Wash (also purchased at HD, nothing fancy here) and sanded to a smooth finish. -Then, I took the drawers out, took the drawer pulls off and primed the rest with Zinnser Bullseye Primer (the kind that says sticks to all surfaces- it’s awesome!) No stripping or sanding required. 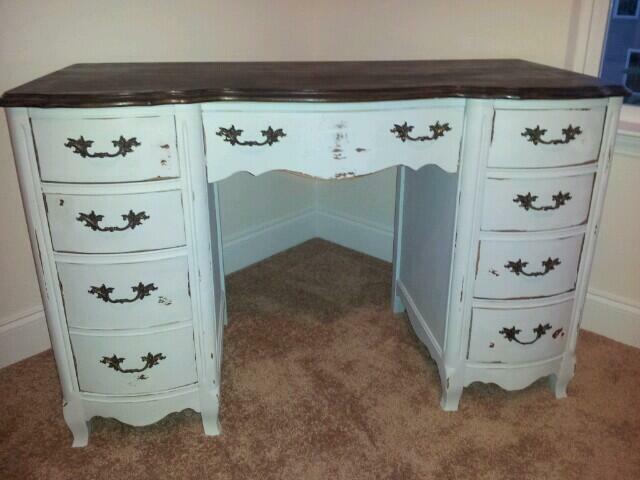 -After a coat of primer, I painted the rest of the desk and the drawer fronts Glidden-Silver Screen. It’s an almost white, almost grey, almost the tiniest bit blue color that I love. -I gave it a quick second coat and let it dry. -I protected it all with a Rustoleum matte finish protective spray. At that point it just kind of looked… okay- very plain and you could see my kind of sloppy paint lines between the drawers and places like that. So then came the fun part … distressing! -I used my Black & Decker Mouse sander ($30 @ WalMart) and just went to town on the drawer fronts, edges, and anywhere else I wanted to make pop or blend away some mistakes. That’s when I really fell in love with the finished product! -The last thing I did was go back over with the protective spray and haul that baby upstairs into the office! I did have some trouble with the drawers sticking after I painted them. 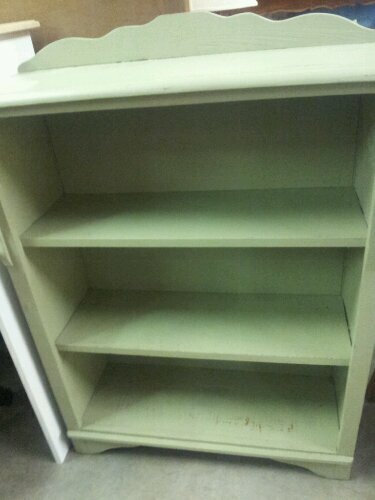 I tried sanding down the tops and sides of the drawers, and that helped, but just a little bit. So, if you have any ideas on how to fix my sticky drawers/prevent future sticky drawers, let me know! I saw this great little vintage coffee pot at Goodwill for $4 and knew it had a place in our house! 🙂 I wound up taking the filter pieces out and using it as a planter and I love it. All you have to do is drill holes in the bottom for water drainage and voila… diy planter! This is as close as I get to gardening. I guess having a green thumb skips a generation in my family. What goodies have you found that could be used as a planter?? 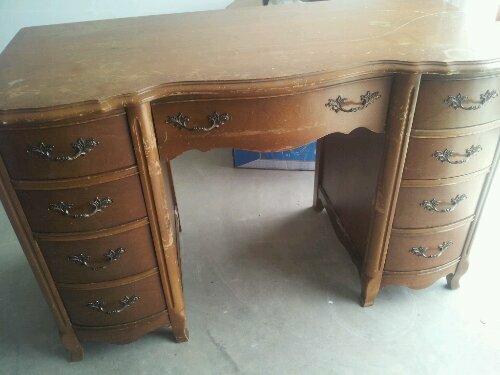 I got this beautiful desk at a garage sale for $15. 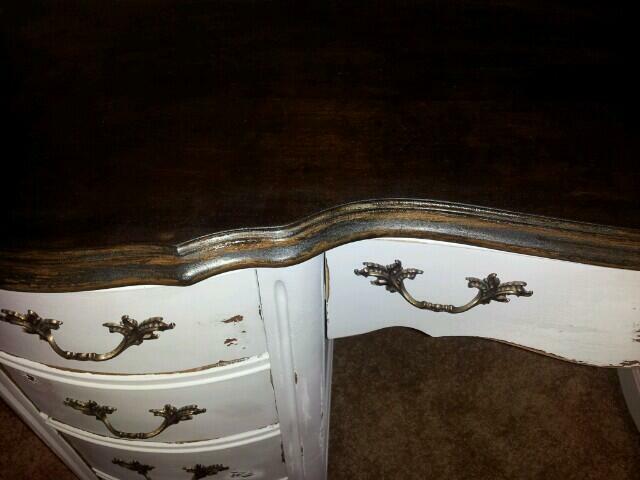 I think I am going to strip it and stain it to match the office. I’m thinking Minwax Jacobean, nice and dark to match the old world map that is going in there. I probably overpaid for this shelf a little bit. But it has great curves and the green was so pretty. It is.going to be a tv stand in the sitting room off of our bedroom. 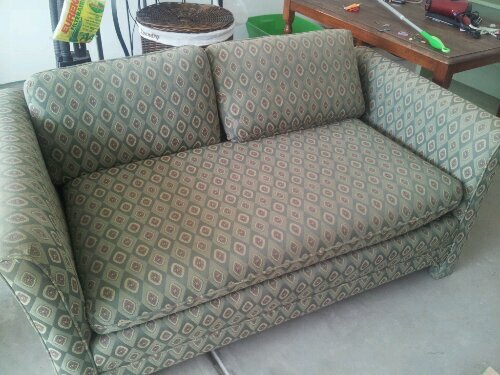 And I got this love seat for $40 at reTAIL, a thrift store that funds an animal shelter. Funny story- I got super paranoid about the possibility of bed bugs so I left it.in the garage and didn’t know what to do. Well while I am out there cleaning it up and convincing myself that it probably has invisible bed bugs and kind of freaking out, our new friend Joe stops in with his wife. I had no idea, but Joe does pest control for a living! God send! So he checked out our couch for us and said it was a-ok! Thanks Joe! Remember my last post about listening to the peaceful sounds of nature and being all heavenly and zenned out? Zen.is.gone. Two days into our brand new house and we have a wet spot on our living room ceiling, right below the master toilet. Clearly the pipe from the toilet is leaking. Gross. We called in the plumber who handles our builders warranty and he said no, it’s not the toilet, it might be rain water… on the bottom floor… right under the toilet that you can hear leaking onto the ceiling below… rain water, right. So he is not going to fix it now. Instead, we need to wait until it spreads further to really make sure it’s the toilet and not rain water. No no no. So I go upstairs and flush the toilet about 50 times to demonstrate that it is in fact the toilet and sure enough it has spread across the ceiling (if it is going to spread I’d rather it be clean flushed water… wouldn’t you?) but by this time he is gone. Moral of the story: Always listen to the woman. The professional is wrong and the husband just listens to the professional. Just listen to the woman. Update: After a several week process the pipe and the ceiling are repaired. But not before I got in a few good I-told-you-sos.